Restructures your water using the power of gemstones, while also boosting pH and oxygenation. For those who are interested in the traditions of Chinese medicine and the harmonious balance of the five elements, this gem-water blend was designed with you in mind. Wood for growth, water for reflection, earth for grounding, metal for strength, and fire for passion. 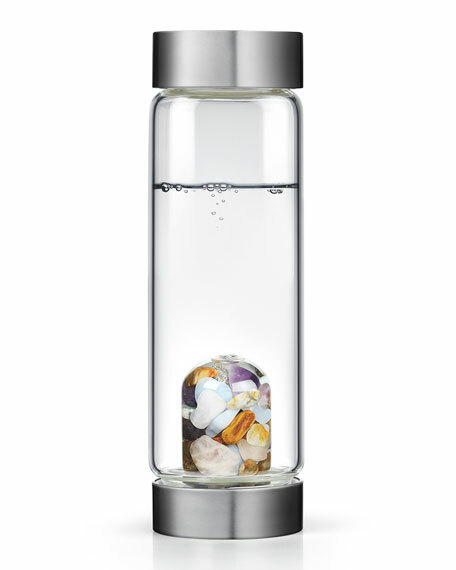 Lead-free borosilicate glass bottle with fair-traded gemstones. Stainless steel cap lined in BPA-free plastic. Traditional Naturopathic Uses: In the healing arts, this blend of amethyst, chalcedony, petrified wood, rose quartz and ocean chalcedony each represent the five attributes and help support your overall well being.